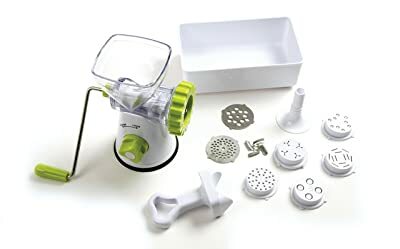 Norpro Meat Grinder, Mincer and Pasta Maker is a 3-in-1, multi-purpose kitchen equipment that allows you to not only grind meat but also mince vegetables and make your own home-made pasta. For its very low price point, it is very inexpensive and comes complete with the various mincing plates required to make good quality ground meat. 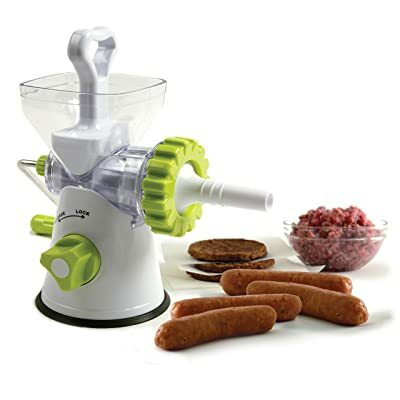 What I Like about the Norpro Meat Grinder ? • Multi-purpose function gives more flexibility to this machine so customers can easily switch from a grinder to a pasta maker without having to buy another machine. 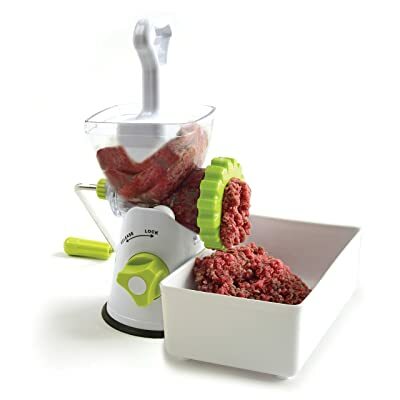 • Different plates for the meat grinder creates the best consistency of meat preferred by the customer. • Comes with a sausage funnel for easier sausage stuffing. • Suction base feature prevents the machine from moving around. • Might be hard to manipulate if your meat is too fatty. • Suction base might be hard to use on some surfaces. In the meat grinder reviews, over 50% of customers were extremely satisfied with this product. They were surprised that for a multi-purpose product as helpful as this, it’s so cheap. They said you wouldn’t be able to tell it’s a cheap machine because it grinds to perfection. There were some issues about fatty meat like pork but trimming some of the fat can ensure smoother flow of the ground meat. Very great buy for home cooks, culinary experts and meat enthusiasts. The price point is amazing and offers multiple uses. The equipment itself is compact and lightweight as it is made from plastic so upkeep and maintenance is virtually effortless. Quality of the meat-wise, it brings freshness and good coarseness setting to the table.